Edging of walkways, curbs, driveways, etc. Sign up for season lawn service today and receive your 8th cut absolutely FREE. Schedule your no obligation FREE estimate today, then start thinking about how you’ll spend all your free time. 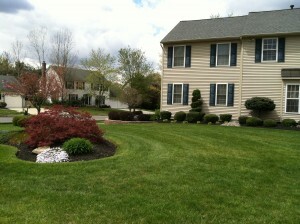 Call (856) 228-2247 to speak with our lawn maintenance expert. Our lawn care expert has extensive training on how to keep your lawn lush and healthy all year round. We have the knowledge to design a fertilization program that will give your lawn the help and protection it needs at key stages throughout the year. Our operators are fully licensed & certified applicators. We offer a 5 step or 8 step program which consist of several applications of fertilizer, pre-emergence for crab grass, broad leaf weed killer, insect and grub control and fungicide as needed. Landscaping is both a science and an art. A good landscaper understands the elements of nature and construction and blends them accordingly. Whether you are starting from scratch or renovating an existing landscape, we are committed to helping you enhance the enjoyment of and increase the value of your most asset – your home! From inspiration to installation, we are with you every step of the way. This is a commitment we stake our reputation on every day. 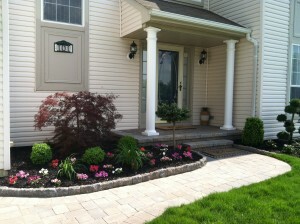 A beautiful landscape for your home or office is just a phone call away! 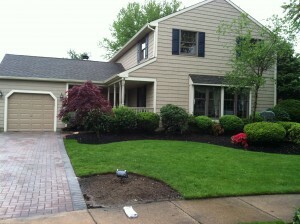 If you call us today, you will receive 10% off any landscaping job over $500! Custom hardscaping is a great opportunity to incorporate your own personality into your landscaping. We install walkways, driveways, entryways, staircases, patios, complete entertainment areas, pool decks, retention walls and decorative walls. From inspiration to installation, we will work with you every step of the way. Don’t forget to mention our website to receive a 10% discount on any hardscaping project over $500.00. In addition to adding beauty and uniformity to your landscaping, mulch is also an important tool to keeping your plants healthy. Adding mulch to your planting beds helps to retain moisture, which leads to healthier plants and flowers. Mulching also helps reduce weed growth. Mulch adds nutrients to the soil, due to it’s natural decay. With over 30 years of experience in both commercial and residential snow removal, we have learned how important it is to take every storm seriously, whether it’s an inch of snow, a blizzard or freezing rain and ice. We are available to you before, during and after the storm. And as much as we love to see the sun after a storm, it creates a whole new problem with melting snow turning to ice as the temperatures drop. Ice management after the storm, is just as important as clearing the snow. We look forward to discussing our snow removal and ice management options with you.